The top three reasons I love summer in order are; 1) warm weather 2) fruit cobbler 3) fresh produce, and trust me, the only reason warm weather comes before fruit cobbler is because without the weather we would not get the fruit. And that my friends, would be a huge bummer. Here is a little cobbler 101……. Cobbler refers to a variety of dishes, particularly in the United States and the United Kingdom. They consist of a fruit or savoury filling poured into a baking dish and covered with a batter, biscuit, or dumpling before being baked. Some cobbler recipes, especially in the American South, resemble a thick-crusted, deep-dish pie with both a top and bottom crust. Cobblers came into existence with the British American colonists because they were unable to make their traditional suet puddings due to missing ingredients and cooking devices. This particular recipe is my great grandmother’s and uses a simple pie crust as the topper. I significantly decreased the sugar in the filling, and also switched it to an unrefined sugar. Cobblers are also great for beginning bakers! 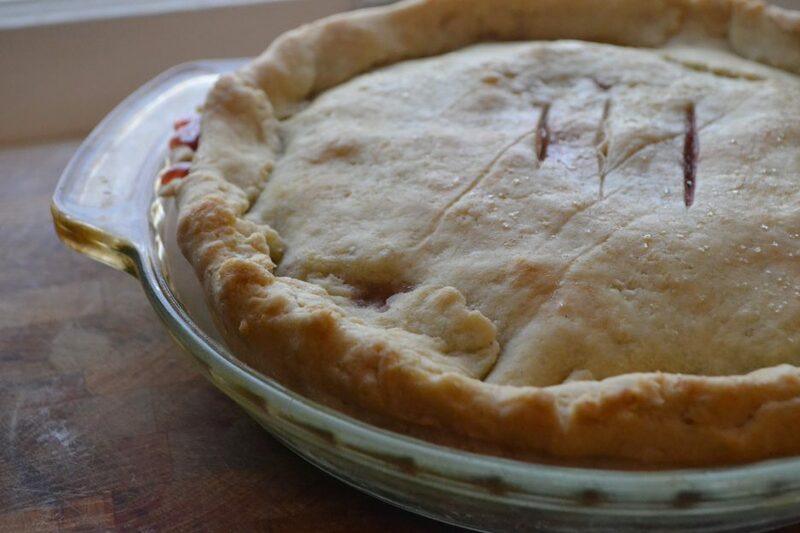 A fruit pie typically has two crusts and takes a little patience and dexterity to assemble. A cobbler only uses one crust and has a more rustic appearance to it, which makes it easier to hide any flaws in your pie crust. And trust me pie crusts can be tricky. You simply roll out one pie crust, lay it in the baking dish, pour in the filling and fold over the edges of the crust. Serve warm with your favorite ice cream!! Our personal favorite is blueberry cobbler with a vanilla coconut ice cream. Combine all of the ingredients in a saucepan and cook over low heat, stirring occasionally, until the mixture has thickened. Set aside. Follow this link to make the Gluten Free Pie Crust. Roll out the dough to be 1/8 inch thick. Place the pie crust into a 9×9′ baking dish. Make sure the crust in set down into the pan and the extra pie crust is hanging off the sides. Pour the filling into the crust. You can trim some of the dough that hangs over the side or you can leave it as is! Fold each side of the pie crust over the filling and make sure to pinch closed the corner flaps once all the sides are folded over. Brush the crust with milk (we use almond milk) and sprinkle with a small amount of sugar. Side Note: If you roll the dough out to be an 1/8 inch thick you will have a good amount of dough hanging over the edges. If you decide to trim the pie crust, then here is what I do with the extra. Put all the scraps of dough together and form a ball. Roll out the dough, in can be anywhere between 1/4-1/2 inch thick. Cut into strips. Melt 1 TBS of butter and brush both side of the pie crust twigs. Sprinkle each side with sugar and cinnamon. Throw them on a baking sheet and put them in the same oven as the cobbler. Bake for 10-15 minutes, flipping once in the middle. Remove them from the oven and either serve as a garnish for your cobbler or they are a slightly sweet treat all by themselves!